YOU SHOULD HAVE BEEN THERE..!! “WHERE DO WE PARK EM ALL”..!! WOW.. WHAT A TURN OUT..!! 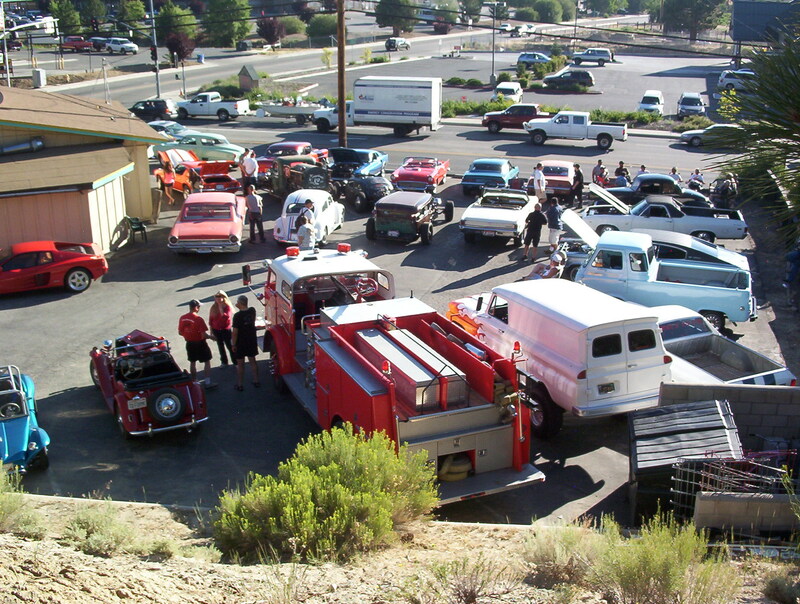 28 CARS SHOWED UP AT GET THE BURGER CRUISE NIGHT.. WE ALL HAD A GREAT TIME..THE MIXTURE OF CARS: FARRARI TO VW..RATS TO CLASSIC MOPARS..MORE FOLKS THAN ERIC HAS SEEN AT ONE TIME IN HIS PARKING LOT..THANKS ERIC FOR YOUR SUPPORT..
OLDIE MUSIC FILLS THE AIR..AS WELL AS THE AROMA OF BURGES AND FRIES..LIFE IS GOOD IN BIG BEAR VALLEY ON WEDNESDAY EVENINGS..!! THE OLD MINERS PARADE IS ON THE AFTERNOON JULY 21st.. BE AT SUMMIT BLVD. BY 3:00 pm..THE PARADE WILL BEGIN @3:30 pm. 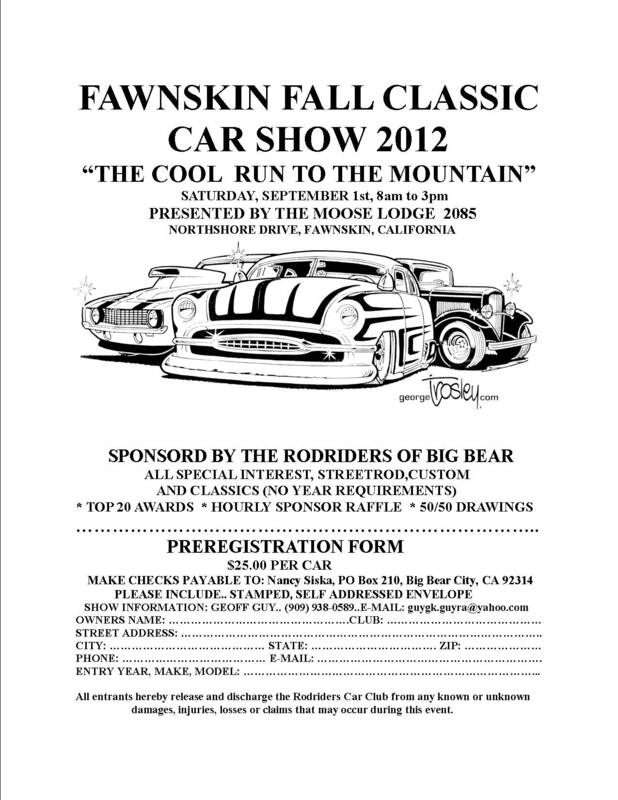 THE DOO DAH PARADE WILL BE ON THE MORNING OF JULY 28th.. BE IN FAWNSKIN BY 9:00 am.. THE PARADE WILL BEGIN @10:00 am. IF YOU ARE PLANNING TO ATTEND.. LET RON KING KNOW PRIOR TO THE DATES SHOWN.. 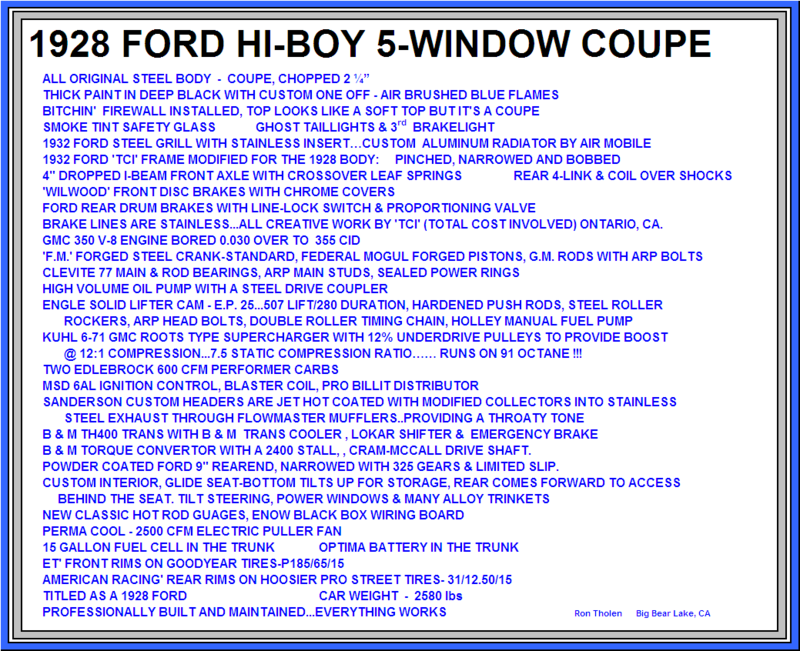 HE SAID HE HAD A CALL FROM LARRY HUFFMAN..LARRY SAID HE WAS GETTING BETTER AND THAT HE WOULD LIKE TO HEAR FROM HIS FELLOW CAR GUY’S..
GIVE LARRY A CALL..HE IS IN A CONVALESCENT HOME OFF THE HILL..